In this week’s gratitude podcast it’s all about how to keep going with a life-changing habit, even if you’re secretly not in the mood – and how my favourite Sanskrit word is the key to your success! Loved This? Please Help Spread The Word! I’ll be back next week with week 9 when it will be time to sort out the stories you’re telling yourself about your comfort zones – and I’ll be giving you my ‘magic question’ for turning that inner critic chatter around. P.S. Not got the book yet? Here’s where to order your copy today. Loved This & Want More? Hi Clare, Well, I’m Down Under at my Mum’s, the wedding’s over, there was also a christening and birthday party. Yes it has been busy. No, I did not mean to leave my Year full of gratitude at home. I did appreciate your personal response. I was surprised you labelled it a complaint letter when I called it feedback. Now I am grateful that I got myself a SiM card with data volume and just listened to week 8 when I have actually missed all of weeks 5, 6 and 7. 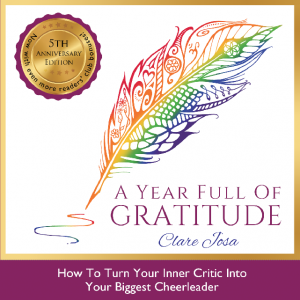 I’m doing my gratitude in my personal diary and your podcast just now really resonated with me. I came in through your FaceBook post and think it’s a great idea to share like that. It took me to where you are now which reminded me of my feedback, when I had to think about all the new people who might come across this for the first time. But this time I found everything clearly labelled and easy to find. So, since it is already late at night, I just listened to the podcast where I was (week 8), then ended up listening to week 7 as well, since I have missed that too with travelling. Now I am all the more grateful and another step closer to grasping your concept of gratitude. If you want my story it’s about not being able to share the beautiful wedding photos which so moved my heart, and now just posting scenes and food and family and other triggers to the same feeling. Bless you Clare. And Thank You!